From research and feasibility study, it is clear that most children often learn faster by using memory devices than any other method. Based on the advancement of technology, several devices have been invented to help children catch fun while learning creative skills. Online memory games happen to be one of the new technologies for helping children learn faster as expected. Studies have also shown that internet memory games for children are highly advantageous in several facets of their lives. Is your quest on the benefits of online memory games for kids? Reading through the rest part of this article will help you discover the importance of online memory games for kids effectively. One of the main advantages of internet memory games for children is to boost their brain functionality. Based on the features that these games are designed with, children can easily learn faster without any stress attached. For instance, matching games have been found to be the most online console available for children.This type of game is simply designed to help children match similar images with respect to color, size, and structure. Since children can easily learn from things they see, the matching games will be of a great source of boosting their brain functionality effectively. Believe it or not, there is every possibility for children to quickly forget things they have learned with proper monitoring. When a child is not being exposed to sufficient images for retention purpose, memory may somehow be affected or reduced. With the help of internet memory games for kids, there is every possibility for children to retain images properly. These games often increase short-term memory. For children who easily forget things quickly, internet games for kids will help to elevate their memory levels. This will eventually help children to retain every little thing they have learned in the past. Enhancing the cognitive skills is another great benefit of internet games for children. The cognitive part of children’s brain is the most active when retaining things learned. To increase the power or strength or capability of the cognitive skill levels in a child, online games for kids can act as the best resources. This is because children remain apt to everything they see and learn. 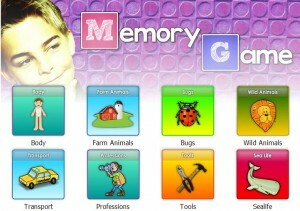 Simon game is a great way of testing children’s memory easily. You will have to make your children practice colors in Spanish. One important thing to know is by following the instruction of the colored buttons effectively. Once this has been achieved, make sure to allow your children click in the right order on the buttons. This idea or combination can be repeated by allowing your children to use their memory. This is the easiest way of using Simon Game. Through constant practice, your children will finally develop the knowledge of retaining images faster in their memories. 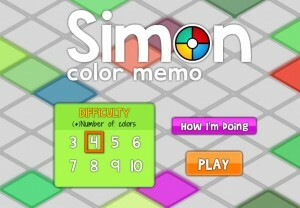 Play Simon game and have fun testing your memory; while practice the colors in Spanish. Follow the pattern of the colored buttons then click in the right order on the buttons and repeat the same combination using your memory. In other to train the visual memory of your children for positive results, you can easily apply the Simon game strategy along with internet memory games for kids. You will discover that your children will always retain everything they learn quickly. You can give it a try now.